This website this aimed at hikers, but discovering the beauty of Tajikistan all started with a fantastic bicycle ride in October 2009. For those who want to do an independent cycle tour for around 8-12 days, the circumnavigation of the Shakhdara Range in the Southern Pamirs is probably one of the best options. There's no need to arrange additional transport apart from getting to Khorog and away again. 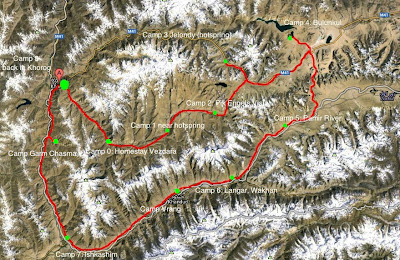 The loop is about 650km (including a side trip to Bulunkul) and gives you everything the Pamirs has to offer. Great vistas of iconic mountains (Pik Engels and Pik Karl Marx), high mountain passes on one of the most spectacular roads in the world and a peek in the life of the people living in this harsh environment. Below I'll give you an idea how to organise it yourself. The best map to use is the map "The Pamirs" by Markus Hauser. From Dushanbe you can either try to fly to Khorog (this can take, like in our case, many days as the plane only flies when the weather is perfect). We chose to arrange a jeep for the two of us. The price changes almost every day. The last time I took a jeep from Khorog in 2012 it was around 350 Tajik Somini, about US$75. We paid for 5 people, as this was the only way to get a car exclusively. The trip takes normally around 16 hours, but many things can happen along the way that makes the journey a lot longer. In Khorog we stayed in Pamir Lodge, run by a nice family. The lodge is pretty basic (they were building at the time so maybe they have more comfy accommodation). The garden is great to prepare your bike and equipment. Hit the road that's headed in the direction of Roshtqala. Just outside there's a check post where you will have to register and show your GBAO permit. The road is still surfaced and the incline is not too steep. The first night we stayed in the home stay in Vezdara (camp 0), because it is still populated here and to help the local economy a little bit. Shortly after Vezdara the road becomes a dirt track that follows the Shakhdara River. We set up camp 1 close to the hot spring between Jarajand and Nimos (which is for some reason not on the new Pamir map by Markus Hauser). Be prepared for some curious kids checking out the tent, as there are not many cyclists coming through. After Rubot the valley opens and you enter a spectacular plateau with great views of Pik Engels. It is easy to find a camp spot all along this stretch of road. At the end of the valley a steep, rough climb up the Maisara Pass which is almost 4300m. 17km took us 3 hours... The descent on the other side towards the Pamir Highway is exhilarating, proper downhill mountain biking! We went down on a smooth road to Jelondy because they have a hotel and hot spring there (a very very hot hot spring). The next day we had to go back up with Bulunkul as the next destination. It is hard work climbing the Koitezek Pass (4271m), but once up the world of mountains here is stunning. Snowy peaks all around, hardly any cars apart from the odd Chinese lorry. We decided to stay in the lovely home stay in Bulunkul. This is a great place to stay a bit longer for walks near Yashikul and the mountains around it. Back track the road towards the Pamir Highway and just a few kilometres after entering it turn right on the dirt/sand track up the Kargush Pass (4344m). This is a tough section, obviously because it's high altitude and going up but the road is very sandy at places. Sometimes you just have to get off your bike and hike for a bit. After this pass it is essentially a 100km downhill (only a few small climbing sections). We set up camp along the Pamir River, which is the border with Afghanistan. We could see herds of yak going down to lower altitudes for the winter. Next stop Langar, a great little place and a good location to walk up to the base of Pik Engels (see trekking descriptions). We did the stretch Langar to Ishkashim in two days, stopping over near Vrang. There are a couple of home stays here and again, a good base to see the archaeological sites. The cycling was hard going: lot's of sand on the road and in fact in the air. The wind was brutal. After Ishkahim where we stayed in the local hotel, we headed for Garm Chasma. Every Tajik knows this place and is raving about it. In 2009 it was a village under construction, but it lacked a bit of charm. The hot spring is pretty cool, well worth the 6km up the hill from the Ishkashim-Khorog road. After that is was straight to Khorog to enjoy the great hamburgers in the restaurant on the banks of the Ghund river.